The cover photo of the Eagles album Hotel California. I am a massive Eagles fan, and naturally the news that greeted me first thing in the morning today when I opened Facebook announcing that the Eagles’ founder, Glen Frey, has passed on has made me incredibly sad. Frey, an incredibly gifted crooner and songwriter, with fellow Eagle Don Henley wrote and sang a steady stream of songs that were the soundtrack of my generation. Back when I was in high school, I was more a straightforward pop and soul fan than anything else. Thus, standard fare for me were the likes of Barry Manilow, the Carpenters, the Jackson 5, the Stylistics and many other similar musical acts. It was the Eagles who first cajoled me into a change of genres to the guitar-based folk rock songs that were such great favourites in the mid-seventies. The Eagles had been around for a while when I graduated from high school in 1975, but it was their global hit “Best of my Love” that turned me into a certifiable fan. That the song would become an immortal was evident even back in the day. Just to show how popular it was went like this: the radio playing in the bus I took from Lipa would have played the song at least twice by the time I got off in Manila. It was not unusual for the song to be playing in the jeep I took from Vito Cruz to Taft; or for it to be playing as well on the radio when I arrived at the boarding house. It was that big a hit! At the time, there were whispers that the song’s outrageous popularity was because it carried satanic undertones. Wikipedia gives a different story with both Frey and Henley quoted as having given plausible explanations. However, Wikipedia is not at all comprehensive about what people were conjecturing. First, there was the backward masking. For the benefit of the mp3 generation, backward masking is to forcibly play vinyl records backwards or counter clockwise as opposed to the records’ normal clockwise rotation when music was being played. Now “Hotel California,” played backwards, allegedly contained satanic messages like “Yes Satan organised his own religion…” I use the word “alleged” because I never gave backward masking a try. I bought records with money I could barely spare and, thus, did not want to risk destroying these by trying. Then there were the alleged subliminal messages contained in the lyrics themselves. As I recall it from an article in a music magazine I purchased back in the early eighties, “Hotel California” actually refers to a hotel in San Francisco that served as the Church of Satan in the city. I am writing from memory here and it has been three decades since, but if I recall things correctly, 1969 was when Anton LaVey, high priest of the Church of Satan, supposedly purchased the San Francisco hotel. Frey was supposed to have said that the “steely knives” was a playful reference to another big band of the era called Steely Dan. However, anyone who has read up on the occult will quickly recognise a possible reference to the sacrifice of animals during satanic rituals. 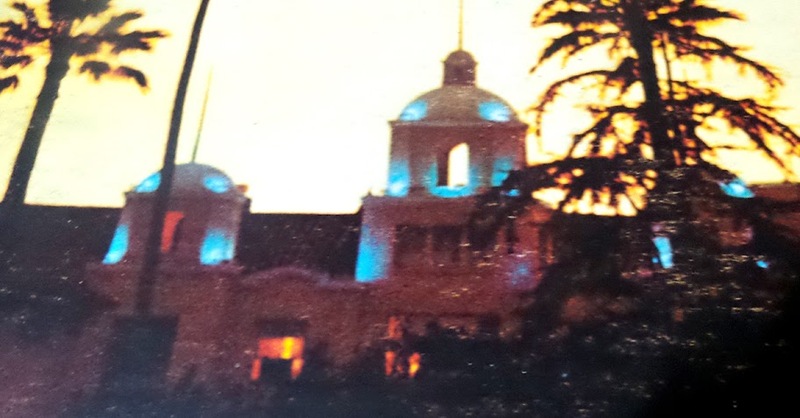 Then there was the cover of the album also titled “Hotel California,” which was what else but a picture of the very hotel that was then already the Church of Satan. Then, in the inside cover, the members of the band were shown posing in the lobby. 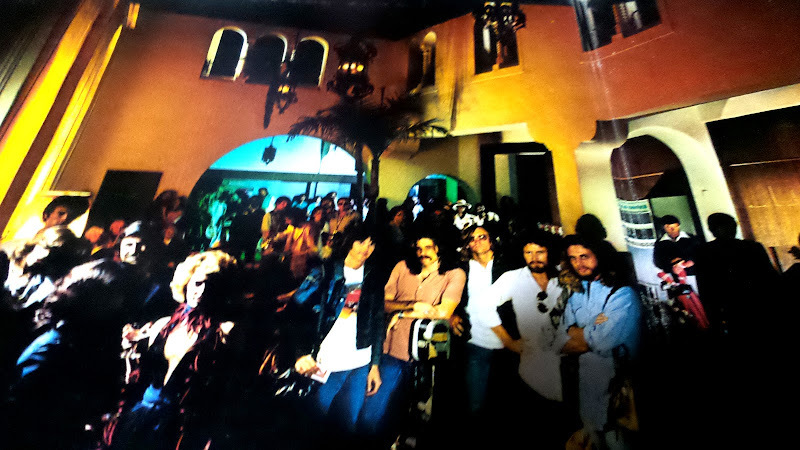 The album's inside cover shows the band posing in the lobby of the hotel. Now, those of you who still have your vinyl albums of Hotel California, you may want to take a moment to bring these out. If you have not noticed this before, look up to the three darkened windows overlooking the lobby from the mezzanine. Now look closer at the middle window. Barely perceptible in the dark, there is a figure of a man. 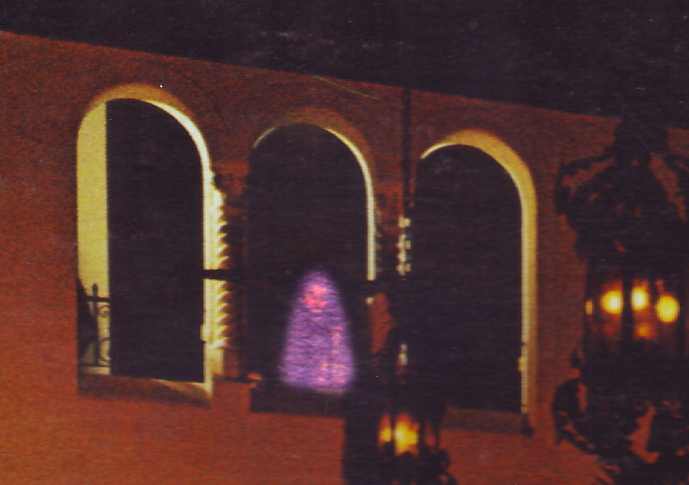 Below, I have PhotoShopped the figure to make the image of the man more visible. According to that magazine I mentioned earlier, the man in the picture was none other but LaVey himself. 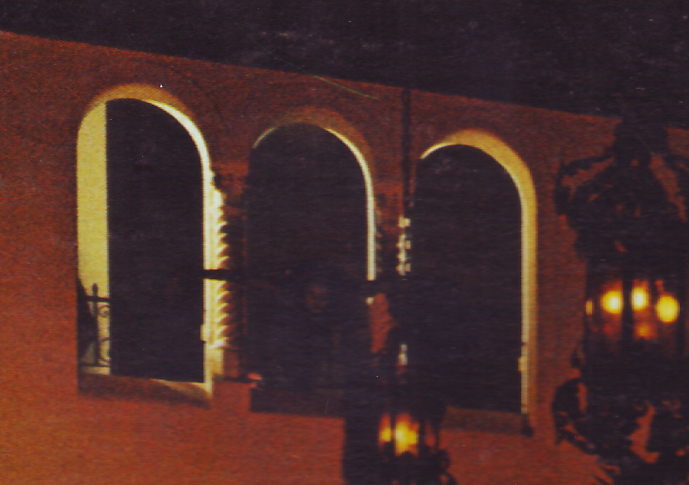 Zoomed, the three windows at the mezzanine. The same picture with the middle window lightened up. What the article was implicitly conjecturing, if I remember things correctly, was the possible connection of the band or its members to the Church of Satan; or if at all the song was somehow a subliminal promotion of the church. There were those in California disturbed enough to publicly destroy their copies of the “Hotel California” single. Personally, I could not care less. To this day, I still think that the song is one of the best ever written. Never mind the lyrics, I think Joe Walsh’s and Don Felder’s guitar licks to end the song were the most delightful ever to be immortalised on vinyl.